Joseph F Wehinger, 77, passed peacefully on Sunday, February 10th 2019, at Superior Residences of Brandon. Joe was born in Allentown, Pennsylvania to Francis and Ethel Wehinger. 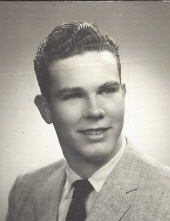 He went into the Air Force after completion of high school and was married in April of 1964 to Theresa Maxwell. After leaving the Air Force in 1965 he resided in Brandon. He loved camping, going to the beach and touring the United States in Recreation Vehicles with his family. He was a realtor for the Brandon area up until his retirement at 65. He is survived by his wife, Theresa; his daughter, Dr. Kimberly Tyson; son, Joseph Wehinger; 6 granddaughters, Katie, Bree, Jessica, Lyndsey, Leah, and Jenna; sister, Gail Karwacki, and her husband, Tony; his niece, Melissa and 2 nephews, Scott and Jeff. A Celebration of his life will be held 3:00 P.M. Monday, February 18, 2019, at Southern Funeral Care, 10510 Riverview Drive, Riverview. In lieu of flowers, donations can be made to CART (Coins for Alzheimer's Research Trust), http://www.cartfund.org/cart/cartfundgive/ OR If someone wants to make a memorial donation by check: Send to: Linda Johnson, District 6890 CART Chair @ 1200 Kinsmen Drive, Auburndale, FL 33823. To send flowers or a remembrance gift to the family of Joseph Francis "Joe" Wehinger, please visit our Tribute Store. If someone wants to make a memorial donation by check: Send to: Linda Johnson, District 6890 CART Chair @ 1200 Kinsmen Drive, Auburndale, FL 33823. "Email Address" would like to share the life celebration of Joseph Francis "Joe" Wehinger. Click on the "link" to go to share a favorite memory or leave a condolence message for the family.